Propertybase Mass Email Campaigns allows you to send or schedule emails for your entire contact database, design and customize templates, view detailed reports and statistics for your sends and more. Mass Email Campaigns takes the features normally found in a standalone email marketing suite (and the extra associated costs) and makes it available inside Propertybase - which you already use! In this article we will cover the steps required to configure email campaigns as well as an overview of all available features. Important: Some configuration is required prior to using Email Campaigns for the first time. Click here to learn more. Note: Customers migrating from a third-party email marketing platform to Propertybase email campaigns should be respectful of contacts that have previously opted out of correspondence. Ready to send some campaigns? In this section we will learn how to build, schedule and send email campaigns. Note: Before sending campaigns, click here to verify all installation steps have been completed. Not sure how to use the application launcher? The application launcher (a.k.a. "app" launcher) can be used to access most Propertybase features. If you don't see a tab for something, there is a good chance you can still find it in the app launcher. Follow the steps below to open Email Campaigns using the app launcher. To open the app launcher, click the "nine dots" in the top left corner of the screen. Locate and click Email Campaigns in the feature list. When you first open Email Campaigns, you will be presented with a list of recently viewed Email Campaigns. If you haven't viewed any campaigns recently, this page will be blank. If you would like to view "All Campaigns", you will need to create that list view. Follow the instructions below to do so. Not a reader? Watch this video instead. Click the gear icon to open list view controls, then click New. Fill out the fields according to the image below, then click Save. Leave the filter options at their default settings. Done! You just created a new list view for email campaigns. You can view all your campaigns by changing the current list view to "All Email Campaigns". Use the table below to learn more about creating and modifying email campaigns. To create a new email campaign, click the New button in the top right corner of the screen. To modify an existing campaign, click on the campaign name. Once you open a campaign, you will notice that there is a "path" at the top of the screen. This path shows your current position in the creation process. In addition to this path, there are a few other interface elements that will help you navigate email campaigns. Use the table below to learn more about these interface elements. The path at the top of the screen shows your current position in the creation process. You can navigate the elements of a campaign by clicking on any of these four stages. You can save your current progress at any time by clicking the Save button in the top right corner. By using the save feature, you can edit your campaign at a later date without losing progress. Note: Closing a campaign without clicking "Save" will erase changes to the current campaign. To move from one stage to the next (see "Campaign path" above), use the left and right arrows at the bottom of the screen. Note: Using these arrows will not erase changes to the current campaign. The first screen, when creating or modifying a campaign, is the "details" screen. If you are creating a new campaign these fields will be blank; if you are editing an existing campaign these will be filled with the information you entered previously. Use the table below to familiarize yourself with each detail field and how it will effect your campaign. This field is used to distinguish between the different campaigns in your Propertybase account. This field is for internal use only and will not be visible to recipients of your campaign. This field will be used as the first part of the from address. For example: if you entered "name", this would result in the campaign being sent from "name@domain.com". Lowercase is recommended. This field will be used as the second part of the from address. For example: if your domain is "example.com" this would result in the campaign being sent from "name@example.com". Administrators can change the domain in the Control Center. For instructions on changing the domain, see the "Domain Settings" section in the "Prerequisites" tab on this page. This field will be used as a label for the from address. For example: if you entered "Company Name", this would equal "Company Name <name@example.com>". Using your full name or company name is recommended. This field is used to determine who will receive the current campaign. Campaigns can only be sent to "lists". These lists can be created and modified using the Contact Manager. For more help using the Contact Manager, click here. This field is used to send the current campaign to recipients outside the selected list. When entering more than one additional recipient, email addresses should be separated by a comma. This field will be used to determine the subject for the current campaign. Once you have determined details for your campaign, the next step is to select a template and add some content. Click the "right" arrow at the bottom of the screen to continue. You can save your progress at any time by clicking the Save button in the top right corner. This can be done from any of the campaign screens: Details, Template, Content or Send. By using the save feature, you can edit your campaign at a later date without losing progress. To save your progress, click the Save Progress button in the top right corner. To learn more about using templates, click the "Templates & Content" tab at the top of this page. Once you have determined the details of your campaign, it's time to select a template and start adding content. Templates that display this indicator are fully editable. This means that you can add and remove text, images, listings and more using the content editor. If a template does not show this indicator, that means it will not support content editing. It is recommended that you only use "editable" templates when creating email campaigns. Note: This information applies to the "email_template" template type only. Not all MJML features are supported. Please test all custom templates before using them in a campaign. Please pay attention to the update change log as this may change in future versions. To create your own templates, follow the configuration steps below. Once complete, open the application launcher, select "Templates" and then click the "New" button. Required configuration for creating custom templates. Click here to learn more about MJML. Each available template on this screen will display a preview image (if available), the name of the template and a drag and drop indicator if applicable. Note: Selecting a new template after creating content (see "Defining campaign content" below) will erase your work! To select a template, click the blue select button beneath it. Once you select a template, you will automatically be taken to the content screen. Once you have defined details and selected a template, it's time to define content for your campaign. Currently, there are six different types of content available to campaigns: text, listings, dividers, images, buttons and raw code. To learn more about specific content types, click on the individual sections below. Use the table below to learn more about adding text to campaigns. To modify the size of text, highlight it and select from the list of headings. To reset text to the default size, select "text". To modify the style of text, highlight it and select from the list of formatting options. To insert merge fields, click the "code" icon in the bottom left corner and select from the available merge fields. For example: "First Name" will automatically pull the "First Name" field from the recipient's Contact record. Use the table below to learn more about adding listings to campaigns. You can search your listing database using the search bar. This will display results that contain your search query. Using the drop down menu, you can select which template should be used to display the selected listing in your campaign. To add a listing to your campaign, simply click the "plus" sign on the left side of the listing. Once added, this will change to a green checkmark. Note: Not all listing templates work with all email templates. "Inline Listing with 1 Image on the Left" and "Inline Listing with 3 Images on the Left" should be used with the single column email layout only. Use the table below to learn more about adding dividers to campaigns. Like other content types, a divider can be added simply by dragging it to a content area in your template. Currently, there are no formatting options available for dividers. Use the table below to learn more about adding images to campaigns. You can search your image database using the search bar. This will display results that contain your search query. To upload new images, use the upload button. To add an image to your campaign, simply click the "plus" sign on the left side of the image. Once added, this will change to a green checkmark. Note: Only images 1 MB or smaller will show up in this list. This size limit will be increased in the future. Keep your eye on the release notes! Use the table below to learn more about adding buttons to campaigns. Use this field to determine a button's text. To link a button to a specific URL, select "Web address (URL)" and specify the URL in the address field below. To link a button to someone's email address, select "Email" and specify the email address after the "mailto:". Note: The email link will not work if the "mailto:" is not included. You can change the alignment of the button, within your email, but using the available alignment buttons. You can make a button "full width" (take up the entire horizontal space of a content area) by toggling this option. Use the table below to learn more about adding raw code to campaigns. To add HTML to an email, drag the "raw code" content type to any content area. Your HTML should go between the table tags, where is says "insert your code here." Once you are satisfied with the content in your campaign, the next step is to send it. To learn more about sending and scheduling, click the "Sending Campaigns" tab at the top of this page. Note: Footer information (name, phone number, etc.) is filled using the recipient's contact owner. However, if that information does not exist the sending user's information is used. To use this feature, accounts must update to Propertybase 1.551. Click here to update. Once updated, open Mass Email Campaigns in the Control Center. At the bottom of the page, check the box next to Send on Behalf. Note: Free version limited to 10,000 contacts. To increase this limit please contact your Account Executive. Before sending or testing, you should review your campaign for errors, misspellings, out-of-date listings, etc. Note: If your campaign includes listings, please verify that the information has not changed since you first added the listing to your campaign. There are several ways to preview your campaign content, each with its own benefits. Review the table below for an explanation for each feature. Use this preview option to see what your campaign will look like on the average mobile device. This preview renders your campaign using your web browser. Use this preview option to see what your campaign will look like on the average desktop computer. This preview renders your campaign using your web browser. Use this preview option to see what your campaign will look like within the average email client. This preview takes into consideration how email clients will render your campaign. Once you have visually reviewed your campaign, it's a good idea to review the details of your campaign. These details are shown to the right of the campaign preview. Note: If you see an error, you can make changes on the "Details" screen. To access the details screen, click "Details" in the path at the top of the page. If the campaign preview and details look correct, the next step is to test your campaign. To test you campaign, enter one or multiple email addresses in the field below. Once you have determined who should receive the test, click the Send Test Email button. Once you've tested your campaign and are ready to send, you have two options. You can send your campaign immediately or schedule it for a future time and date. If you would like to send your campaign immediately, you can do so by clicking the Send Campaign button. After reviewing the information displayed, click the Send Campaign button. Your campaign will be scheduled immediately. However, it generally takes 10-20 minutes for your campaign to be delivered to your selected recipients. If you would like to schedule your campaign for a future date and time, you can do so by clicking the Schedule Campaign button. After selecting a date and time, click the Select send date button. Note: Your campaign will be scheduled immediately. Once scheduled, a campaign is no longer editable. In addition, updates to contact lists or listing data will not be reflected in the campaign. You will need to unschedule your campaign, update the appropriate information and then reschedule your campaign. To unschedule a campaign, click the Unschedule Campaign button. One of the most powerful benefits email marketing has over traditional marketing is the ability to track how many people opened your emails and see exactly what was clicked. Email Campaigns in Propertybase are no different. Note: Individual contact statistics require configuration. Learn more. Once enabled, users can track individual statistics for each email campaign sent in Propertybase. Click the yellow box below to view instructions for enabling this feature. Once enabled, continue reading to learn more about utilizing this powerful feature. Users have two options when enabling email campaign statistics. The first of which is the ability to track statistics for individual contacts. Selecting this option will track metrics like click rate, open rate, bounce rate, etc. However, individual "events" will not be shown. In other words, you will see that a contact opened your campaign twice and clicked a URL three times (see image below), however you will not see what time they opened, clicked, etc. or the URL that they clicked on. Note: This feature consumes data storage in your account. Once enabled, Propertybase will create a new "event" record for each interaction a contact has with one of your campaigns. Click the yellow box below to view instructions for enabling this feature. Once enabled, continue reading to learn more about utilizing this powerful feature. Note: Email events require configuration. Learn more. The image below shows an example record for an "open" event. Included in this record are fields like contact, email type, event type and more. Upon successful delivery of an email campaign, campaign-wide statistics become available. These stats include important metrics like open, click, bounce and unsubscribe rates. To view these statistics for a campaign, follow the steps below. Next, click on a campaign with the status of "sent". When you open a sent campaign, you will notice that the regular "details", "templates" and "content" sections have disappeared. These sections are replaced by a single page showing you an overview of the campaign details and content, as well as a new "send details" section. Scroll down the page until you see the "Send Details" section. In this new section, you can see percentages for who opened, clicked, bounced and unsubscribed from your campaign. These statistics will help you tailor your future campaigns to be even more effective. In addition to viewing statistics for your campaigns within the Email Campaigns object, it's also possible to use the same data points to generate reports and dashboards in Propertybase. In this section, we will walk through the steps required to build a report based on the "opens" metric. Through this exercise you will acquire the knowledge needed to build out reports for other campaign metrics like "bounces", "clicks" and "unsubscribes". Note: New to building reports? Click here for an overview of how reporting works in Propertybase. First, click the Reports tab at the top of the screen. Note: Don't see a Reports tab? You can also access Reports, like any other object, through the application launcher. Next, click New Report in the top right corner of the screen. From the list of report types, select Email Campaigns. In the top left corner, click the pencil icon to rename the report. Name this report "Email Campaigns - Opens" and then hit enter on your keyboard. Next we need to add columns to our report. These columns will tell us information (name, subject, number of recipients, etc.) about each campaign sent. Next, add the following columns to the report and reorder them based on the image below. With our columns in place, the next step is to add a group so that they can be organized by rows. In this example, we will use the campaign name for our rows. Nice work! All of our columns and rows are in place. Next we need to make sure our filters are appropriate for the type of information we want to display. Click Filters in the top right corner of the screen. 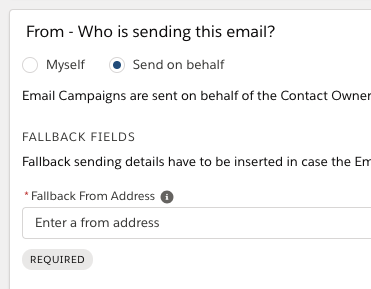 Next, click "My email campaigns" and determine if you want to see only your campaigns, or if you would like to see campaigns sent by ALL users in your Propertybase account. If you only want to see your campaigns, you can leave this at its default value. In this example, we will select "All email campaigns". Next we want to add a status filter so that we only see "sent" campaigns. It doesn't make much sense to include campaigns that haven't been sent, right? Click "Add Filter..." at the top of this section. In the list of filters, select Status. For filter options, set the Operator to equals and then type "sent" in the second text box. When finished, click Apply. At the bottom of the screen, uncheck "Row Counts", "Subtotals" and "Grand Total". Next, at the top of the screen, click Add Chart. Click the "cog" icon to modify chart properties. Underneath "Display As" select Column. Next, let's add another unit of measurement to our chart. Click "+ Measure". Copy the settings so that they match those in the image below. Lastly, set the Legend Position to Bottom. Click Save & Run at the top of the screen. In the next window, name your report and also determine which folder it should be saved to. Note: If you would like this chart to be available to all users, make you save it to a public folder. Congratulations! You just built a beautiful chart displaying open rates for your email campaigns. With the knowledge gained in this exercise, you can build reports for other key email campaign metrics. What if content or my contact list changes after I schedule a campaign? When you schedule a campaign, Propertybase makes a "snapshot" of everything related to your campaign. This includes recipients, content, listing information, etc. If any of this information changes within your Propertybase account, you will need to unschedule your campaign, update the appropriate information and then reschedule your campaign. See the "Sending Campaigns" tab on this page for more information. Emails are bouncing to some recipients, but I verified them with an email checker. Why? Like all major email marketing platforms, Propertybase uses a mail delivery service to fulfill campaigns. Typically an email bounces when the recipient address is invalid. However, sometimes the recipient email server classifies the email as spam, based on patterns within the email content. When this happens, there is nothing Propertybase can do. Typically, these types of detections will happen regardless of what email provider a platform uses.